The USU Eastern Women’s Basketball team had a rough road streak losing the past four games on the road. lot more wins thus far. The Eagles are averaging 24 fouls a game. Paur said, “Every one of those games our opponents are shooting more foul shots and they’re making them. We are shooting about 58.6 percent from the foul line and our opponents are shooting about 76 percent from the foul line.” He believes that if his team could foul less and make more free throws, their record could be as good as 6-3. Their past four games were road trips starting on Nov. 14 in Casper, Wyo., against Casper College. USU Eastern lost 94-71; Eastern’s lowest scoring game thus far this season. High scorer was Bryanna Adams with 15 points; Maddy Murphy followed closely behind her with 11. Eastern had a difficult time holding onto the ball with 36 turnovers. They also continued to foul, sending Casper College to the line 31 times. The following day, Nov. 16, Eastern met up against Northeastern Junior College. Caroline Fisher and Larissa Quintana tied for top scorer with 14 points each. Isabella Costa dominated the boards with 18 total rebounds, 13 of which were offensive. However, Coach Paur’s theory definitely rings true in this game. Eastern made more field goals than Northeastern, however they lost on the foul line allowing Northeastern JC to attempt 31 free-throws. Eastern allowed themselves to be beat on the foul line and it cost them the win. The final score was 86-82. 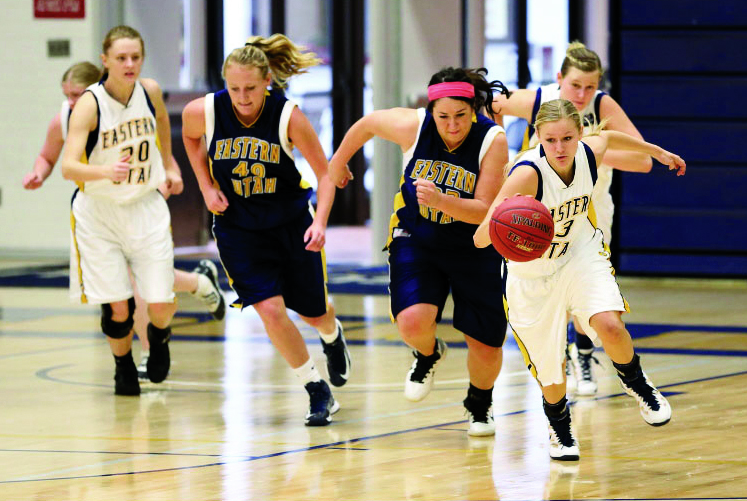 The next weekend, on Nov. 29, the Lady Eagles traveled to Ephraim, Utah, to head up against Gillette Community College. Top scorer for Eastern was Adams with 23 points. Isabella Costa had an outstanding game. She achieved a double-double with 10 points and 10 rebounds. Eastern couldn’t buy a bucket though, making only 33 of 81 field-goal attempts. Gillette only attempted 69 but shot 59 percent from the field which helped them to outscore the Eagles and come away with the victory; 107-98. On the following day, Nov. 30, Oterojun and USUE played in Ephraim. Adams led Eastern again in scoring with 18 points. Costa grabbed eight boards. Eastern rallied as a team to drop 13 three-pointers in the game. However, Eastern paid the price for fouling again, letting Oterojun make twice as many free throws, which helped them defeat Eastern 83-75. 7 p.m. after which they will play the Salt Lake All-Stars the next day at 1 p.m.